Party Ponies and Friends does several events open to the public. Some of these events are completely free some are fund raisers that have a fee for participation. Please read the information about each and follow any links that may be provided. Each May. Usually the first or Second Saturday. 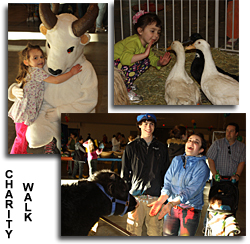 This is a great way to support local Alaska Charities! Also known as the �5K graze to raise�, walkers travel through downtown Anchorage where they will stop at different food stations along the way. Walkers finish at the grand finale �WOW event� with dessert, live entertainment, a beer and wine garden, children�s activities and prize drawings. Muldoon Community Assembly on July 4th at 7041 Debarr Rd. Looking for something to do in the Anchorage area this Halloween. Want a safe place to bring your kids. Come join us for games, petting zoo and fun at Faith Christian Community Church. South Anchorage Assembly 12101 Brayton Dr.
Party Ponies and Friends has been fortunate to participate in this wonderful community event, supporting the very community of which we are located. We participated in this event for 15 years. We would love to continue this support. We recommend early booking for the summer months to ensure our participation. If you live in the Houston community and would like to see our horses and critters return year after year, we recommend that you call City Hall and let them know. The planning for this event changes hands often so community support is vital to ensure that we will be there. This event is open to the public and is held in the Mountain View Community. Celebrating the community with live music, Food and a variety of entertainment from the local community its self. Dancers from local schools and youth programs as well.